Sydney Coast Walks is the passion project of husband and wife team Ian and Tara Wells. Ian founded Sydney Coast Walks in 2009 as a tourism business after travelling the world for nearly a decade, and realising his own backyard was worth sharing. Joined by his wife Tara, a former ABC radio producer and communications manager, Sydney Coast Walks provided guided walks in Sydney’s national parks, winning tourism awards and working with local, state and national tourism organisations to promote Sydney experiences. By 2018, Sydney Coast Walks had completed the transition from tour operator to travel blog, providing a worldwide audience with insider knowledge to explore Sydney independently by foot . This unusual combination of deep understanding of quality tourism products and services, mixed with online flair and journalistic training, makes Sydney Coast Walks a unique voice in the travel and nature/adventure space. Why Work with Sydney Coast Walks? We offer skills and services to brands and destinations to increase their exposure to an engaged audience of predominantly Australian travellers seeking more authentic experiences. 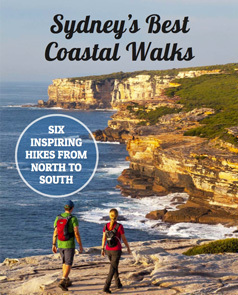 Sydney Coast Walks creates inspirational and instructive content that provides useful tips and detailed resources to move readers from dreaming about a journey to making it a reality. A combined social reach of 12.3K+ across Facebook, Instagram, Twitter, Pinterest. We only take on work if we believe it will genuinely benefit our readers, the brand, and us – in that order. We seek to partner with brands that reflect our values, our passion for travel, and brands that can make our readers lives richer. Our blog posts, photos, social media updates, and YouTube videos share our real travel experiences. Combined with useful and actionable tips, your visitors have everything they need to follow in our footsteps. We experience your destination in a way that suits our readers' and our interests, as well as your needs. With an understanding of story angles and audience, we co-create authentic campaigns with you. When working with us we can operate as a couple, or solo. We also have a young family and will increasingly be sharing content on hiking and nature-based soft adventure with children. Our videos are designed to inspire, inform and entertain in an authentic and relatable way. While both Ian and Tara are warm, enthusiastic and relatable on camera, the experience or destination is always the star. Both Ian and Tara have been featured in publications such as The New York Times, Sydney Morning Herald, The Guardian, Great Walks and BRW. Ian has been featured on TV programs including Sydney Weekender (NSW), Postcards and Coxy’s Big Break (Victoria). On radio Tara has been interviewed by Catriona Rowntree on Macquarie Radio’s travel show. See Sydney Coast Walks in the media. As a freelance journalist, Tara Wells may pitch relevant story angles to mainstream publications, in addition to coverage on Sydney Coast Walks. Need professional content created for your publication? Read more about Tara as a freelance print journalist. As a legacy of Tara's journalism background and our continuing professional standards, all commercial opportunities are fully disclosed to readers and shall not undermine the accuracy, fairness or independence in the creation of content. Sydney Coast Walks maintains editorial control. Please email Tara Wells at [email protected] to discuss any opportunities that may interest our readership.